Italian Carlo Facetti was as capable as a driver as he was as an engineer. Particularly the start of the 1981 Daytona 24 Hours served as a poignant example of this rare combination of talents; against an army of Porsche 935s, Facetti managed to clock the fastest lap of the race in a Group 5 Ferrari 308 GTB that he had engineered himself. Sadly, the charge ended early due to a holed radiator but to this date, the records show Facetti and his Ferrari as fastest of all during the 1981 Daytona. The Ferrari used by Facetti was referred to as the Carma FF, which was short for CARlo Facetti and his long time associate and backer MARtino Finotto. 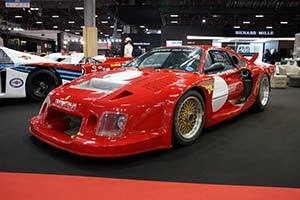 Like the earlier Group 4 cars built by Facetti and others, the Group 5 racer was built on an existing 308 GTB street car. More specifically, one of the very early cars built between 1975 and 1977 as these featured a lighter fibreglass instead of the steel bodywork of the later GTBs. The shell was effectively stripped bare retaining only components required for homologation like the the doors and roof. One of Facetti's earlier projects was the development of four-valve heads for the Ferrari Dino V6 engine that powered the Lancia Stratos. He did exactly the same for the three-litre V8 of the 308 GTB. In addition to the bespoke heads, Facetti also equipped the engine with a pair of turbochargers. Whereas the fibreglass bodied 308 GTBs street cars all featured Weber carburettors, the engine built by Facetti was fitted with Kugelfisher fuel injection. The highly tuned V8 produced between 750 and 840 bhp in race trim, and perhaps as much in 950 bhp at full boost. Mounting the engine and all of its ancillaries in the Ferrari chassis required some creativity, especially because Facetti was forced to retain the transverse layout. This meant that both turbos had to be mounted together behind the V8, on the right-hand side of the engine bay. There was even more out of the box thinking required for the intercooler for which a spot was found inside on the firewall next to the driver's seat. The ducting leading from the intake on the nose to the intercooler was shaped in such a way that it actually looked like a second seat was fitted.